= 5% of the total expenditure. Out of the given combinations, only in combination (d) the difference is 5% i.e. For an edition of 12,500 copies, the amount of Royalty paid by the publisher is Rs. 2,81,250. What should be the selling price of the book if the publisher desires a profit of 5%? Clearly, S.P. of the book = 105% of C.P. Let the selling price of this edition (of 12500 books) be Rs. x. Then, 15 : 105 = 281250 : x => x = Rs. (105x281250)/15= Rs. 1968750. If for an edition of the book, the cost of paper is Rs. 56250, then find the promotion cost for this edition. Let the Promotion Cost for this edition be Rs. p.
Which two expenditures together have central angle of 108�? 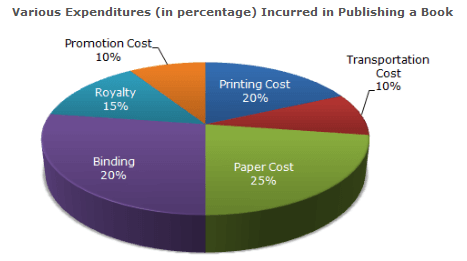 = 30% of the total expenditure. Therefore Binding Cost and Transportation Cost together have a central angle of 108�.